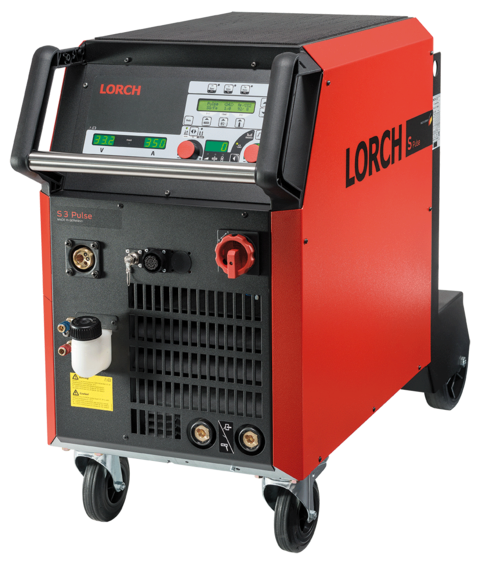 The 300 to 500 ampere models included in Lorch's S-series are powerful enough to weld materials of all levels of thickness. the welding process. The results of this smooth interaction are superior duty cycle levels and maximum productivity. characteristic and change it from soft to hard. you are ready to handle any welding task they can throw at you. you can place on its top. standard welding processes and have been certified by an approved and independent authority. amount of spatter cuts down the need for costly rework. and detect and avoid any errors before they become a problem. your machine, you can choose between a compact or wire feeder system and a dual wire feeder variant. combination with a PushPull torch or a Lorch NanoFeeder. influences as flying sparks or dust. Quatromatic lets you save three individual parameter settings and select these in 4-step mode using the torch trigger. without having to make any additional preparations. at a time using the Up-Down torch when performing recurring welding tasks. components right away after connecting your welding data monitor or external operating panels via a LorchNET cable.